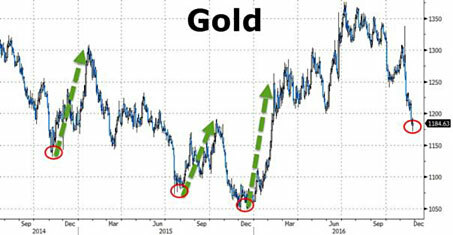 Precious metals expert Michael Ballanger charts recent moves in the gold market and sees a rally in the making. Last week I felt that IF gold broke $1,180, it could see another $140 downside, taking it to the December 2015 lows of around $1,045. 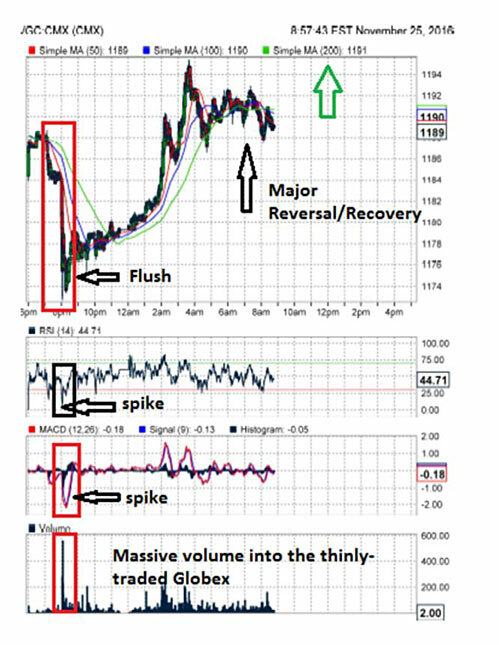 I also saw that the Relative Strength Index (RSI) was at the extremely low levels usually associated with bottoms. However, a blatant intervention/liquidation occurred last Thursday at exactly 8 p.m. EST, and more importantly, 9 a.m. Friday Beijing time, whereby a massive order executed into a ridiculously thin Globex market on U.S. Thanksgiving took the gold price down through that $1,180 support, before it turned at $1,172.80. As of 11:30 a.m. EST Friday, gold was back to $1,182.85, after rallying all the way to $1,195 very early Friday morning. Friday's Crimex close will be a battle, but an "up" day will do wonders for the thoroughly demoralized gold and silver markets. 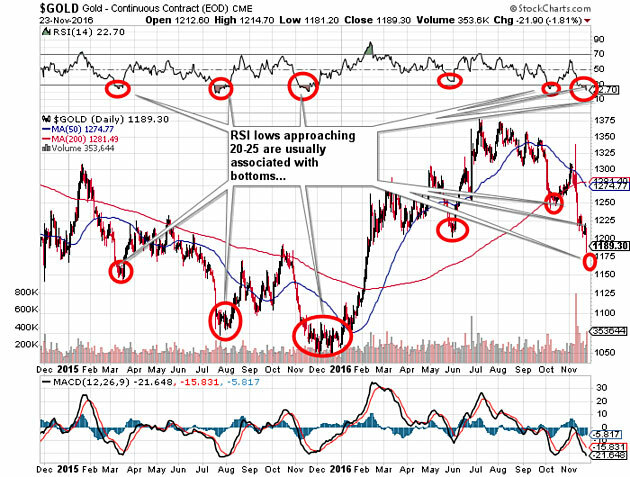 The fact that the gold market recovered so quickly confirms that demand is definitely alive and well, and that the RSI in the low 20s is strongly hinting at a short-term bottom for the precious metals. In fact, in closing out the week above $1,180, gold held critical support, which would be the best tape action in over three months. 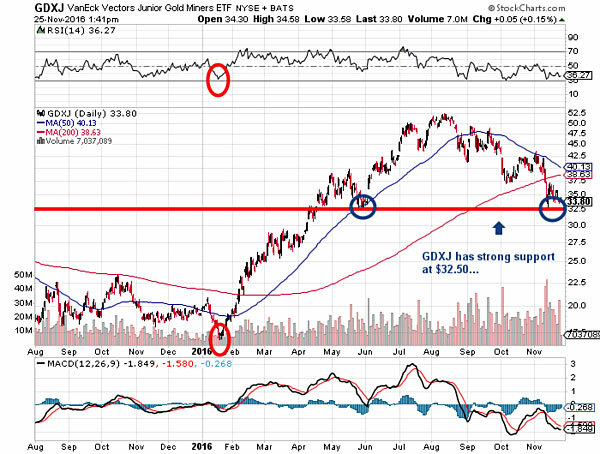 The VanEck Vectors Junior Gold Miners ETF (GDXJ) should be due for a tradable rebound and a possible intermediate-term bottom, as sentiment for the juniors has evaporated to "black bearish" once again. While not quite as severe as on Jan. 19, 2016, it has really eroded since the highs in July. 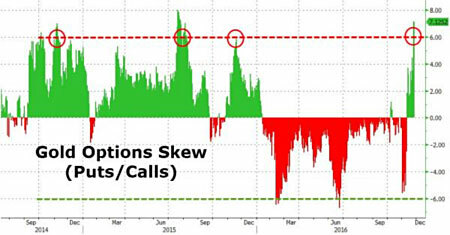 Finally, as for sentiment, I lifted a couple of charts from the Zerohedge website (which are actually compliments of Bloomberg) that show the last three times the gold options "skews" were this bearish were in November 2014, July 2015 and November 2015. We are right back there now as you can see below. The sentiment numbers are telling me that there is a wicked rally coming and from where I sit, the GDXJ Feb $35 calls at $2 might be a decent defined-risk method of speculating on the turn. On Monday, when I get a look at the COT report, I will know for sure. 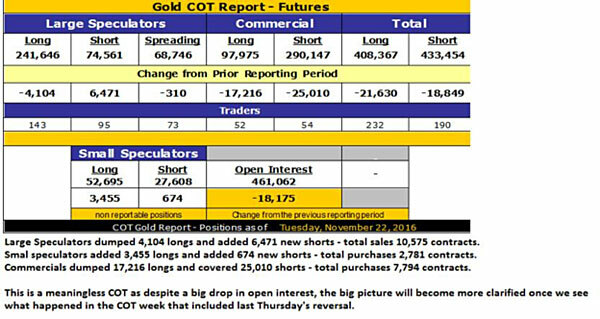 The COT report from Tuesday, Nov. 22, when gold traded around $1,220 just before the carpet-bombing it took down under $1,200, was marginally constructive, but also largely meaningless because it did not include the data from last week, when the bullion bank criminals finally forced the coerced CAPITULATION they had long been seeking. However, it would appear that they read my comments about sentiment extremes last week, because open interest continued to decline as they took down even more of that forensically enriching short position. If you thought the bullion bank Christmas parties were ostentatious last year, watch this year and take a few notes. Last year, they took $140 per contract out of a near-162,000 contract short position, and this year they will book profits on over 200,000 contracts. I would estimate that the latter half of 2016 is the singularly most profitable year EVER for the banksters. And while we have grown to understand it, I think it is all part of the "Elite Class" imposing yet another "hidden tax" upon the underlings who are striving for sound money and the Rule of Law. The obscenely large short position totally condoned, completely sanctioned and adeptly ordered by the ruling class of countries like India has earned the bankster class the right to remove legal tender from distribution at an alarming rate, as Mr. Modi attempts to alter the customs and mores of a culture and society many thousands of years old. But then again, that is what bankers do. . .they want a cashless society so that they are the ultimate guardians by way of digital monitoring and privacy invasion. Keep your eyes open as we move toward year-end. The fireworks are going to be incendiary.